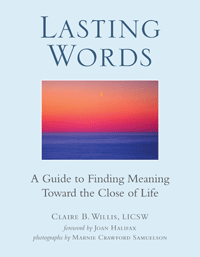 Lasting Words: A Guide to Finding Meaning Toward the Close of Life appeals to healthcare professionals, clergy, hospice workers and caregivers, partners, and families of loved ones who are dying. It is equally important to those in the latter parts of their lives who seek personal reflection and guidance. This video/book trailer sums up the tenets of the book beautifully. Below are links to interviews and other press. Contact publicist Benita Gold at 617/489-1208 or Benita@benitagoldpr.com to find out more and to request an interview. Lasting Words was featured on The Conversation Project March, 11, 2014. Clinical social worker, ordained Buddhist chaplain, and yoga instructor Willis asks readers to think about how they want to be remembered, as in her work she has found that many dying individuals experience the need to answer unresolved questions and to offer a legacy to those close to us who are left behind. The author provides a framework with examples for expressing gratitude, hope, forgiveness, wisdom, and finality. The images by documentary photographer Marnie Crawford Samuelson enrich the material by offering a glimpse of the simple beauty existing all around us. VERDICT A worthwhile read for those whose loved ones are facing a serious illness or who are merely in the midst of reflecting on life.